I’ve been rushing again. Not covering much ground, because most of my rushing is done at home and much of it doesn’t even require movement – it’s as much as anything a helter-skelter of the mind. Slowing down has become a much overdue necessity. I’ve been unexpectedly helped in this by a companion of many years to whom I’ve given too little attention lately. He’s been with me since I was around the age of two, and apart from a lengthy leave of absence some years back when he went on extended loan to my mother as a teaching assistant, he’s never been too far from my side. 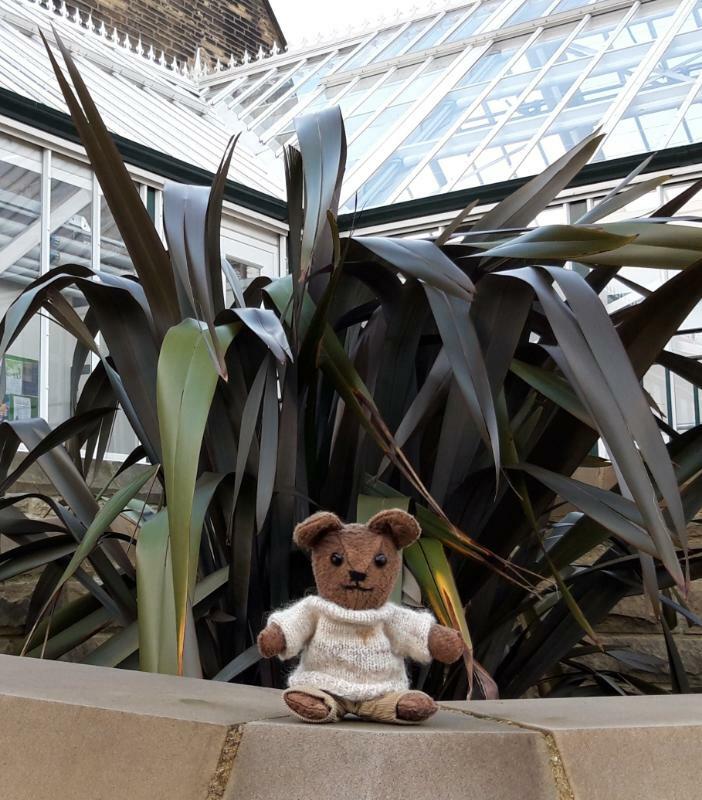 Treacle is taking part in a photographic project I’ve initiated that involves going out on location, and because he is a bear of diminutive stature this means that I find myself as often as not crouching down or even sitting on the ground. There’s something about doing this – connecting with the ground more closely than I normally do when standing up – that is immediately calming. It’s also true that working with Treacle is always a reassuring and balancing thing to do, partly because he’s an old and trusted friend but also because of his expression which is subtle but encouraging. As my sister observed, it’s not always easy to tell what he’s thinking – but certainly he looks out at the world with a mixture of curiosity, interest and wonder, and an unfailing sense of optimism. These pictures were taken in the Glasshouses at Cliffe Castle. Outside when it’s not frosty it’s muddy, but there are still places where we can find stone or other dry surfaces to sit on, or clamber over. And when the ground is frozen, there’s nothing better than getting down close among the leaves……. It turns out that this is the two hundredth post I’ve published on this blog. I’d not been counting, but WordPress tells you these sort of things, and I can’t think of a nicer way to celebrate than with my small and constant friend. A big thank you to all of you who’ve been with me along the way, and the wonderful people I’ve met and feel I know as friends in the blogging world of WordPress.